Ahhhhh, it’s finally Friday. My favorite day of the week. I’m headed up to the library to return some books and take out more. I’ve been reading like books are going out of style this summer! One after the other. I’ve stopped a couple mid book. Just couldn’t get into them for whatever reason. There are a couple authors who seem to be hit or miss. They’re foreign authors, which I think is just a coincidence, but it happened twice. Some of their books are so good, and others seem almost amateurish and far fetched. I don’t know why that happens. Possibly because authors are only human? Yes. Quite possibly. I guess I can tell you who they are. It’s not like I know them personally and they’re going to knock on my door all, “Hey, Meliss, what’s up with the crap book review?” The first author is Liane Moriarity. I fell in love with her book What Alice Forgot… and then I tried Big Little Lies and couldn’t get past chapter one. Same thing with Sophie Kinsella. Loved her book Remember Me, and when I tried I’ve Got Your Number I wanted to shout at the shallow characters. Life it too short to read books that annoy. Anyhoo, we’re gearing up for a fun weekend. Tomorrow we’re going to see the new Bourne movie which we’ve been anticipating for about a year. Matt Damon is actually going to be in this one! Ahhhhh! Can. Not. Wait. Sunday is The Little Log Cabin Power Antique Show in Miesville MN. My friend Nancy told me about it. I guess it’s been going on for about 20 years and I just found out about it! What? I’m glad to find something new to do, and it sounds like it’s right up my alley. I’ll take a bunch of pics and post them in my next “scenes” post and tell ya all about it. Last night, while making supper, our power went out. Jeff had just taken the steaks off the grill, and I was frosting these yummy carrot cake zucchini bars. We decided to take our dinner out to the front porch instead of trying to eat by candle light in the dark house. It was so nice outside for a change. Balmy and about 70 degrees. Afterwards we took a stroll downtown for an iced tea. The power came back on around 9 PM, so it wasn’t that big of a deal. It’s funny how something like that can change the course of the evening though. They’re soooo moist and delicious. 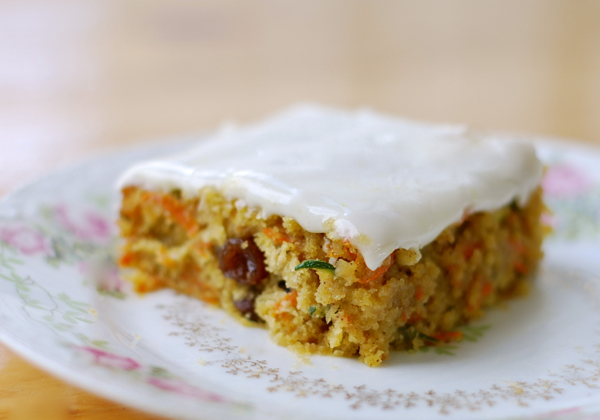 Chock full of yummy carrots, zucchini, and raisins, in a spiced, dense cake. The icing is sweet and tart, and brightened by the flavor of lemon zest. You are going to love this one! Lightly oil a glass 9×13 baking pan. In a large mixing bowl, combine: flour, baking powder, baking soda, ginger, cinnamon, nutmeg, and salt. Mix well. In another mixing bowl, combine: eggs, carrots, zucchini, brown sugar, raisins, oil, honey, and vanilla. Mix until just combined. Add the wet ingredients to the dry ingredients and mix just until combined. Using a rubber spatula, scrape batter into prepared baking pan. Bake for 25 to 30 minutes in preheated oven, or until a wooden skewer inserted into the center of the bars comes out with a couple moist crumbs on it. Place pan on wire rack to cool completely before icing. Mix all until completely combined. Use to ice completely cooled bars. Cover bars and store in refrigerator for up to 5 days. This recipe makes 24 servings. Can these be made into muffin tins and how long do you bake them? I’ve never made this recipe into muffins, so I’m not sure. Sorry I couldn’t be more help.